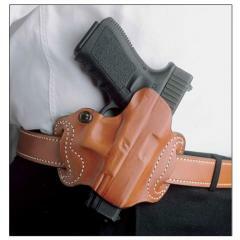 Comfort, versatility and style, the Model 086 Mini Slide Belt Holster from DeSantis has it all. Constructed from the highest quality saddle leather available, the holster is built to stand the test of time. Its detailed molding covers the pistol like a second skin, resulting in a secure, reliable hold that looks great as well. Double-stitched seams are sewn with meticulous care, guaranteeing a reliable build. The integrated tension screw allows operators to easily adjust the holster's retention strength for a smooth, custom draw that feels just right. The Model 086's exposed muzzle and open-top design compliment the gun's appearance for an impressive look that is sure to turn heads. I have another mini slide belt holster for another weapon. After 6 years of almost daily carry, it shows no sign of wear and still securely retains the weapon. Not bad for the price, wish there was a little more leather on the body side of the holster to act as a guard against rubbing. Small holster, and with the right belt you can pull it tight. Wearing at 3 or 4 o'clock. Very nice holster. Little or no break in. Holds my weapon securely. This is my first holster, great craftsmanship very, very easy too break in feels good wearing it and secures at weapon, not worried about it coming out of it. Purchased for my Glock 36 as an alternative to my IWB holster for concealed carry. Very well made, holds the weapon securely and as close to my body as my IWB rig with just a regular belt, and even though my IWB holster is comfortable this is much better because it's more comfortable and it can be worn without having to buy oversize pants to accommodate the extra IWB stuff. Highly recommended. I love the Mini Slide, holds the weapon secure and enables a lightning fast draw.